OMAHA, Neb. (AP) Major League Baseball will come to Omaha for a day next year as part of an initiative to take the product to new places, commissioner Rob Manfred said Thursday. Manfred said there’s no commitment to play a regular-season game in Omaha beyond next year, but that possibility exists. MLB has played regular-season games in Cuba, Mexico, Puerto Rico and also at Fort Bragg, North Carolina, and in Williamsport, Pennsylvania in conjunction with the Little League World Series. The Royals-Tigers matchup also will serve to acknowledge the ties between the college and professional game. It will be played in the 24,000-seat stadium that opened in 2011. ”This may be the best non-major league facility in North America,” he said. Of the 641 drafted players on major league Opening Day rosters this year, 61 percent were from four-year colleges. The Royals chose 34 junior-college or four-year players in this year’s draft; the Tigers picked 35, including the overall No. 1, pitcher Casey Mize of Auburn. General managers Dayton Moore of the Royals and Al Avila of the Tigers started their careers in college baseball. Moore was an assistant coach at George Mason from 1990-94. Avila was an assistant to current LSU coach Paul Mainieri at St. Thomas University in 1988, and head coach there from 1989-92. Among the Tigers’ other ties to the CWS: manager Ron Gardenhire played shortstop for Texas in the 1979, catcher James McCann played for Arkansas in 2009, Matt Boyd pitched for Oregon State in 2013. Their No.1 pick last year, pitcher Alex Faedo, helped lead Florida to the 2017 national championship. Royals left fielder Alex Gordon grew up 50 miles from Omaha, in Lincoln, and played on Nebraska’s 2005 CWS team. The Royals this year drafted Florida’s Brady Singer and Jackson Kowar in the first round. 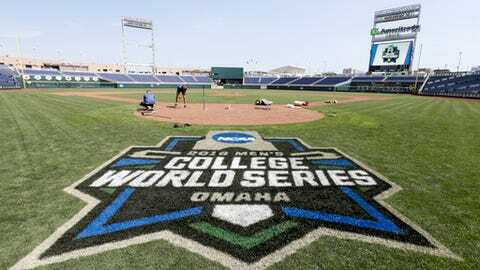 Omaha has hosted the College World Series since 1950. Hall of Fame pitcher Bob Gibson is from Omaha and Royals greats such as George Brett, David Cone and Frank White played Triple-A ball in Omaha, which has been home to Kansas City’s top farm club since 1969.